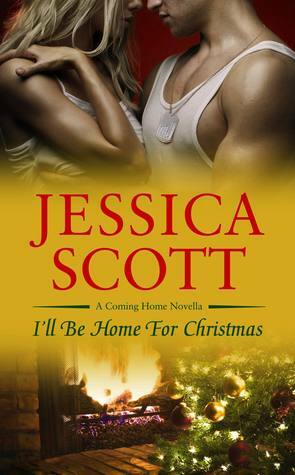 I’ve said it before and I’m saying it again… How have I never read Jessica Scott before?! Her stories have been on my radar for months and I’ve heard great things about them so when this novella came available, and a Christmas one at that, I jumped. I got pulled into I’ll Be Home For Christmas and Vic and Nicole’s story. I’ll definitely be reading more Jessica Scott! This book was a quick read but in the 120+ pages I felt like I knew the characters. The hero Vic and his wife Nicole were real to me and I laughed and cried with them. Oh! I want more of some of the secondary characters too. Vic is in the U.S. Army and gets deployed to Baghdad in December of 2007 leaving his wife Nicole at home. She does her best to be strong and I admired her so much. But she just really wants him to come home for Christmas. I got a kick out of Vic, aka Carponti’s, behavior during his deployment. He cares for his guys and does his best to keep morale up. The dynamics between the soldiers in his platoon felt real, the tension and danger made me cringe sometimes. Through it all Vic’s love for his wife bled off the pages. “I’ll show you caveman later,” he said with a grin…. ♥ He lost himself in the feel and taste of his wife. The beauty of her faith in him and the solid feel of her love. I love Jessica Scott. Looking. Forward to this one! It was so good! Oh! Make sure you enter the release day launch contest. 5 chances to win I’ll Be Home For Christmas! Previous PostPrevious Spotlight on Rachel Firasek’s Drowning + Guest Post + Contest! Next PostNext Release Day Launch for Wanting You by Ryan Michele + Contest!